Fugoo's Bluetooth speaker is an easy choice for listeners looking for an unbeatable value. The full sound performance and seemingly everlasting battery life are well ahead of what its competition is capable of. Fugoo is the Bluetooth speaker market's best kept secret. You probably haven't heard of it, but you'd be remiss not to consider this mini, but mighty, speaker as your next. This is a speaker that's hell-bent on surprising you at every turn. First, it gets you with its customizable look, then it hits you with its booming sound quality. Lastly, it delights with battery life that is unmatched, running for about 20 hours at a loud volume. It's advertised to run for 40, if you cut the volume in half. The Fugoo Style speaker is priced to compete with the latest and greatest Bluetooth speakers, starting at $179 (£169, about AU$281). But, as you'll see, it has some awesome tricks up its sleeve that give it the edge. Talking about the design of the Fugoo speaker requires talking first about what's inside of it. At the heart of each Fugoo is its core: a tough, IP67-protected center. The sturdy build is constructed with plastic and accents of rubber, coming together to offer shockproof, waterproof, and dustproof peace of mind. The Fugoo's core might not look like much, but it offers the solid foundation from which its customizable skins build upon. You'll find a tweeter and passive radiator nestled into its long sides. And on each of its ends, there is a woofer capped by a protective layer that's decorated with a slick honeycomb effect. All in all, this makes for six speakers total inside the Fugoo Bluetooth speaker. On one side of the speaker, there's a microUSB port and a 3.5mm port, each of which Fugoo has provided the appropriate cables for. Glancing over at its other side, there's a power button and Bluetooth connect button. Holding the power button for a few seconds prompts an audible queue, as well as a visual one via its LED indicator, that the speaker is, indeed, turned on. A vocal prompt will follow up with a warning about battery status, should it be low enough to warrant a charge. The core of the Fugoo Bluetooth speaker plays an instrumental role in providing listeners with an experience that's suited to their own lifestyle and listening habits. But, to be honest, it won't win any awards on looks alone. Thankfully, Fugoo offers a few choices to make its Bluetooth speaker fit your sense of style: Style, Sport, or Tough jackets. Each of the options offer a unique look, but differ mostly in how they tip the balance between form versus function. Fugoo supplied techradar with a core, along with a Style and Sport jacket for review. The Style jacket adds another layer of honeycomb-patterned plastic to the already-durable core, covered with mesh fabric and shiny plastic detailing. The Sport option offers up the same slick fabric to cover up the core, but comes stocked with a thicker plastic shell and more rubber to protect the Fugoo in case of a tumble. Installing each of the jackets is a fairly simple process. There are a series of interlocking grooves on the bottom of the Fugoo's core that help each jacket stay snug. Putting the Style jacket on involves sliding the core into the jacket until you hear a snap, which indicates that it has locked into place. The Sport, being the more protective option of the two, requires a bit of disassembly before you can place the core inside. The basic package is priced at $179 (£169, AU$281) and includes the core, a Style jacket in your choice of color, as well as a 3.5mm cable, a microUSB cable and an AC adapter. If you want more than one jacket, the price to add to your collection ranges from $29 (about £24, AU$65) for the Style, to $79 (about £68, AU$129) for the Tough jacket. The Style jacket puts the focus on form, but the Sport jacket works to add more function to the Fugoo Bluetooth speaker. Once the Sport jacket is equipped, you can attach a host of optional accessories, like a strap mount, to strap the speaker around a tree or pole. It's also compatible with its bike mount, which secures the speaker to your bike handles. These make the Fugoo more versatile, but they are totally optional and don't add all that much to the experience. Fugoo might allow listeners to hand-pick the looks of its speaker to match their tastes, but thankfully, the speaker provides stunning performance out-of-the-box that will impress across the board. Whether you primarily use the speaker inside or out, in inclement weather or on the sunny beachside, you'll be treated to a finely-tuned experience. Connecting to the Fugoo Bluetooth speaker is simple as can be: just tap and hold the Bluetooth button and search for it on your device. Helpful voice prompts chime in along the way to help this process go even more smoothly. Usability is a cinch. You can pause and then resume playback with a press of the circular, center button. If you want to adjust volume, give one of "+" or "-" buttons a tap. If you pay attention to the Bluetooth speaker space, you're probably aware that the buttons on many products have dual purposes. You'll find that on the Fugoo, too. Its middle button can answer or hang up phone calls. You can also bring up Siri or Google Now, depending on the sort of device you're synced up with, by holding the same button for a few seconds. Lastly, changing songs is a breeze, just hold the middle button and tap either the "+" or "-" to skip or reverse tracks, respectively. Sound performance is one of the Fugoo's best qualities. With its six speaker setup, it dishes out the most successful attempt at true 360 degree sound I've heard yet. The sound profile defies its size, pumping out balanced audio full of bass, layered with mids and highs that don't distort. Appropriate for mellow jazz mastercuts, hip-hop and rock alike, I am constantly impressed with the Fugoo. Listening to music on most Bluetooth speakers is enjoyable. That is, until the battery dies. Most speakers of this size tend to have a six to 10-hour lifespan until they need to sip on a power source. That's not the case with the Fugoo Bluetooth speaker; it's advertised to last a whopping 40 hours at half volume. Of course, I had to see for myself. I listened to it at what sounded like half volume for about four hours a day over the course of a week without charging. The total time listening doesn't quite meet the advertised 40 hours, but even so, the numbers it puts up are nevertheless impressive. As I prefer to listen to music a bit on the loud side, I am pleased to see the speaker delivering close to 18 hours at more intense volumes during my testing. As explained earlier, The Fugoo Bluetooth speaker offers support for Siri, Google Now and phone calls. The internal microphone has no problem picking multiple voices in a room, and the speaker can play through phone calls without harsh distortion. The Fugoo Bluetooth speaker might seem to have come from left field if your eyes are only set on the big brands. But, its offering is serious business, especially if your heart is set on killer sound performance, unmatched battery life and a durable build that's able to survive both a tumble and a swim. 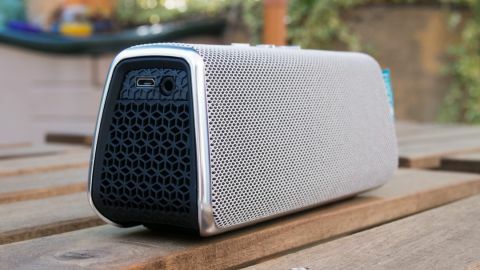 This Bluetooth speaker is priced to take on the likes of the UE Boom, and gets the edge thanks to its true 360 degree sound, reasonable price and all-around solid performance. Hands down, this should be your next Bluetooth speaker.